Hello Everyone! 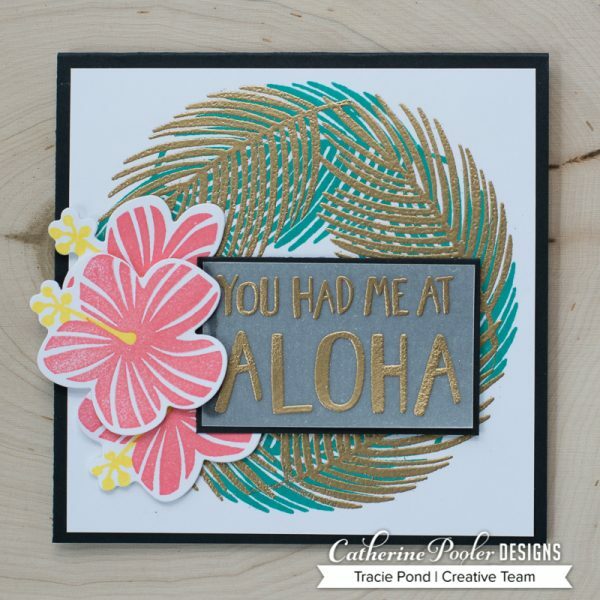 It is Tracie and I am happy to be here today on Catherine's blog sharing a fun card using product from the amazing Tropically Yours Stamp of Approval Collection. This is a 4-1/4 inch square card with a 4 inch panel. Take the panel and stamp the wreath. 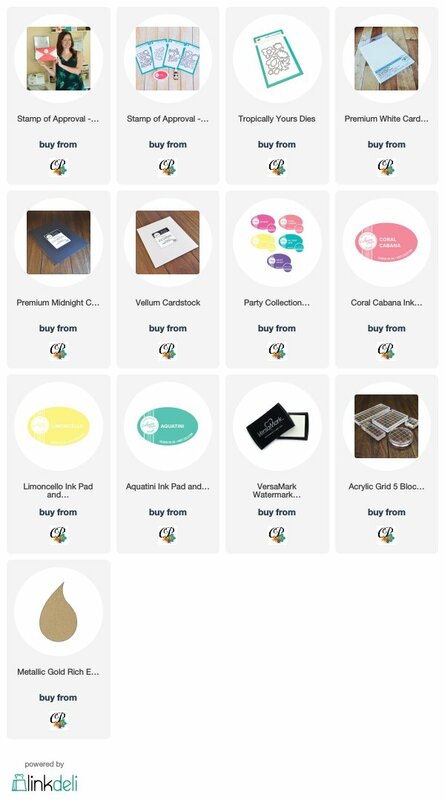 I used my mini Misti, but you can accomplish this easily with a stamp block too. I placed the panel in the corner of my stamping platform. Then I positioned a leaf from the Leave Me in Paradise set on the top center of the panel. The leaf was then stamped in Aquatini ink. Rotate panel and repeat until all four sides have been stamped. Now it is time to reposition the leaf stamp to the corner and then do the same as prior, but heat emboss. 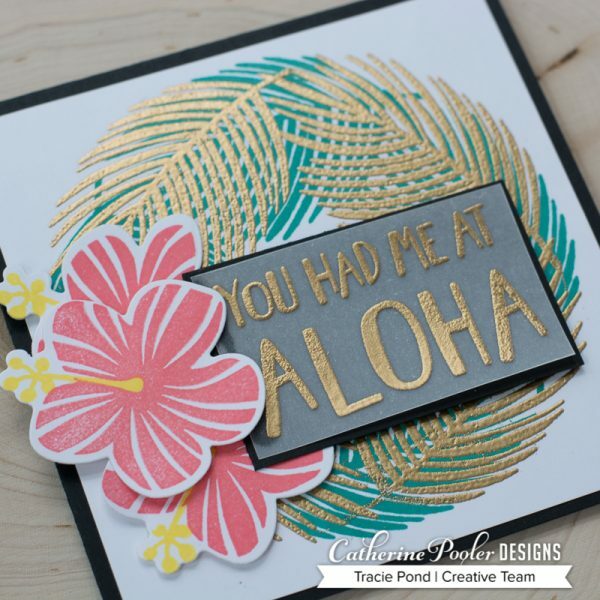 For my heat embossing I used a beautiful gold from WOW Metallic Gold Rich Pale Super Fine, and I only applied one layer. After embossing I adhered the panel to the card base with liquid adhesive. Now it is time to decorate the wreath. I absolutely love flowers and Hibiscus are a favorite. It is actually sad the flowers only last for one day. Stamp and die-cut three of the Hibiscus flowers. I used the fabulous Coral Cabana and Limoncello inks. Adhere the flowers with foam tape. We can't forget about a sentiment. 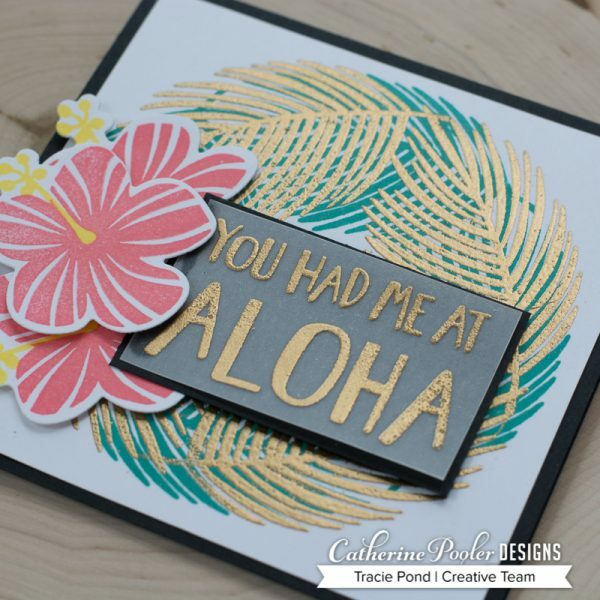 The sentiment is from the Tropically Yours set and is heat embossed on vellum in the same gold color as the leaves. Trim the embossed vellum to 2-3/8 x 1-3/8 inches. Adhere this vellum to a Midnight panel measuring 2-1/2 x 1-1/2 inches. All it needs is a couple dots of liquid adhesive on the left edge. This will get tucked under one of the flowers when the sentiment panel is adhered to the card, hiding the adhesive. Adhere the sentiment panel to the card with foam adhesive. I challenge you to create a wreath with the Tropically Yours Collection. Make sure to tag #catherinepoolerdesigns.